Great teaching is an art. In other arts – painting, sculpture, the writing of novels—great masters leverage proficiency with basic tools to transform the raw material (stone, paper, ink) into the most valued assets in society. To transform students into masterpieces in school, teachers’ expertise and smart working is an utmost criterion. Polishing teachers is an important ingredient for better students’ performance and results. It helps in the betterment of teaching practices, classroom management, students’ engagement, and fruitful activities in the classroom, better learning and educational techniques which help in enhancing students understanding in the classroom. In Pakistan, it is very important to equip teachers with unique methodologies so that they may teach well using low resources in schools. A teacher can transform students with the right use of chalk and challenges and for that professional development is very important. This prestigious institute lacks the trend of professional development of its faculty. Teachers are like surgeons and without proper training in the field of teaching, the output will be disastrous. No one will ever ask any barber to paint a masterpiece without proper training and the same is the case with a teacher. We cannot allow a teacher to teach and occupy a classroom without proper expertise. All the developed countries that have excelled in the field of education have set a trend. They do not allow teachers without proper training into the classroom. In Finland, to be a primary school teacher one has to possess a Master’s in Education degree along with specialization in research and classroom management. In Pakistan, it is difficult to get enrolled in medical or engineering colleges and one has to crack hard nuts to get admission. The same is the case with the field of teaching in Finland. Teachers in Finland are trained, which the main reason for Finland being on top in the world in the field of education. In Pakistan, apart from lacking a training environment, most of the teachers in public and locally private school focus on teaching only. They do not follow a set pattern in school environment like professional development of teachers, faculty meetings with the principal to highlight the problems, aimless activities for the sake of activities only, inhibition of reading habits in students, and collaboration among teachers which may help in maximizing the student’s learning and developing leadership habits. Most of the teachers are not aware with the latest happenings in their chosen field of teaching and teachers only share what the text book in the class is offering. 1. Teachers should paste an article in print form on the notice board, after approval from the head, regarding modern teaching methodologies, classroom practices, student engagement, and updated innovation about teaching. The list should be prepared and it should be made compulsory. It will help in sharing ideas and developing a reading habit among teachers. In Pakistani schools, teachers do everything except reading and research. 2. In a school, each department should collaborate and present something latest like a Nobel Prize winner’s work etc. in their field of studies with the students in the form of a seminar once a week for an hour. 3. Evidence based teaching should be encouraged and the principal, being head of the institute, should collaborate with the teachers to practice it in classrooms. 4. School administration, especially in the case of private schools in Pakistan should make it incumbent upon teachers to submit a ‘Masters in Education’ degree within two years of their service. The school should help financially in this regard. 5. An increment should be given when a teacher presents five training certificates arranged by the school administration and on his own. All the certificates should be verified later. 6. It should be made compulsory on the teacher’s to paste Bloom’s Taxonomy charts in their classes and follow it in their lesson planning. 7. Upon hiring a teacher, a copy of the ‘National Curriculum of Pakistan’ should be given to every teacher and he/she should be instructed to strictly follow it while practicing in the classroom. 8. On a 50/50 partnership basis, schools should get membership for their teachers of leading educational associations. Most associations offer concessions on group membership like ASCD. 9. Once a month teachers’ sessions should be arranged in the presence of school administrators and one guest speaker, if possible, in which innovative ideas along with school improvement plans should be discussed. 10. It should be made obligatory on teachers to publish something in any magazine keeping in view their field of education. A research paper published in a journal shall be awarded with increments. 11. Trips and other events should be arranged after every three months so that the understanding level among teachers and students may increase. 12. B.Ed. degree from distance universities should be banned as they lack classroom practices and mostly are gained through unfair means. ​All of these mentioned in the above sentences if implemented will help in the long run in the improvement of educational system in Pakistan. In order to prepare a solid improvement plan and advocate the concept of training in Pakistan in schools, suggestions from readers will be highly appreciated and noted. 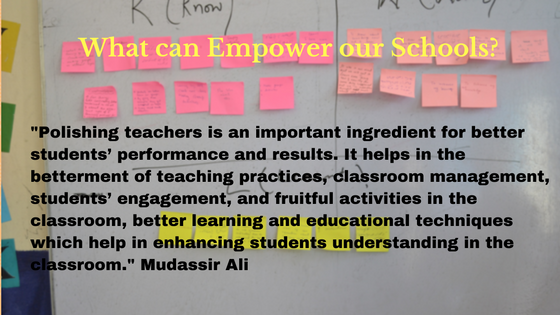 Mudassir Ali Shah is a ‘Certified Instructional Leader’ from University of Massachusetts, USA. 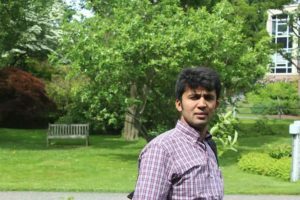 He currently teaches in Wapda Cadet College, Tarbela and advocates teacher training in all sectors of education in Pakistan.